Humans and dinosaurs peacefully co-exist in our modern age. One night, Yuuma Asahikawa meets the feral t-rex, Churio. Follow the lives of (secret) ex-delinquent, Yuuma, and the very Cretaceous Churio as they spend their days together! 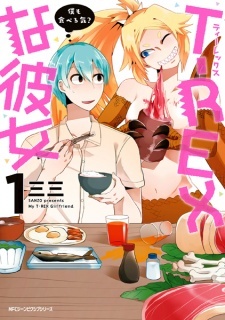 T-Rex na Kanojo was published in English as My Girlfriend is a T-Rex by Seven Seas Entertainment from November 1, 2016 to January 17, 2017. Well there's not much story into this. It's just this guy met a half human half T-rex chick to move into his apartment complex. Well don't expect a very good art from this but it kinda suits the atmosphere of the manga which is the "fun" atmosphere. If we're talkin about character development well there ain't much but there might be in the future. They don't rush into these kind of things so it might take a while for them to develop the character but if you're asking me I don't really want too much development. Well the purpose of this manga is to make the reader feel fun and relieve stress. So yeah it's a very fun manga. 66 million years ago the non-avian dinosaurs went extinct during the Cretaceous - Paleogene mass extinction, however, in this manga they managed to adapt in this manga world they are living peacefully in our modern age. That's right, this manga has dinosaur girls. Hold on to your butts! If you ever like monster girls and think about dating an anthropomorphic dinosaur girl, be sure to give this a go. This was my very first manga I've read (first I needed to figure out how to read a manga, heh) and today Timz0r-senpai will give you some insight about this manga. Basicly it's a typical story were boy meets girl with mundane Slice of Life elements with a pinch of comedy on the side. In this case, boy meets dinosaur girl. In this case, a female anthropomorphic Tyrannosaurus rex named Churio and the human boy his name is Yuuma. This manga basicly tells you some troubles you can face if you ever going to date an anthropomorphic dinosaur. Too bad the story ended very fast and it really felt to me it got axed for another project. I don't think we will ever see a continuation of this story. The art style is not really one of my favorite so far with the manga art that I have seen so far nowadays, but I do like the details that has been put in in the dinosaur girls thier dinosaur parts. Fans of dinosaurs really should reconize the dinosaur the dinosaur girl represents. As a self-titled paleontologist in training I give the author props for giving the dromaeosaur-girl even feathers like it should be. I love the charathers in this manga. It's not a common sight you will see partly dinosaur girls interact in todays world and I love they have thier own prehistoric personallities what you would expect from a dinosaur girl. For being my very first manga I've read and the fact I had to figure out first in which order I need to read a manga, I actully enjoyed this manga. In overal I think this manga was a good & fun read and I would recommend this one if you like monster girls, dinosaurs and can deal with mundane Slice of Life elements, combined with the struggles of romance and comedy. The bad part of it, well, as I already told you; it ended very fast and it really does feel it got axed somehow. Fans of monster girls, you've got to try this! Not only is this a new take on the idea of monster girls, it's one of the better slice of life love comedies out there. If you like Ojojojo, Ninja Shinobu, etc., you will love this. Perfect slice-of-life elements. The only pity is that it's too short. Sweet, to the point, and funny, this will lift your spirits after wading through a swamp of trashy dramas. It wraps up pairings nicely, without making anything feel forced, and it's one of the first romance where a confession doesn't occur, and isn't necessary at all. Fits this mange well. Simplistic background and scenery, but characters are well drawn to fit their nature and personality. For a monster girl that's both dinosaur and human, you can feel the rawness in the art style that reflects the "Cretaceousness" of their primal side, like in how teeth are depicted with much more crudeness. Yet, you can also feel the typical cutesy Japanese manga girl from elements like hairstyle and eyes. There's also some good attention to detail as well, and certain elements maintain their needed continuity across panels. Unique, fun, memorable, and likable. Although their personalities might be slightly cliche, the addition of the dinosaur element evens things out and keeps things fresh. Character growth is apparent as the series progresses, and characters that is initially unlikable makes a reasonable comeback. One of the better aspect though is probably the translator's skillful and...liberal use of language in dialogues, which adds to the realism. I thoroughly enjoyed this manga, although I definitely think more could be done. It has so much potential, breaking one of the new frontiers of the monster girl genre. While character backgrounds were explored, it certainly could have done much more towards that end. And, ffs, it'd just be nice to see more of the characters interacting with one another. Read it. I highly recommend it. This was my first Manga i finished reading. A short story, i always wanted to read manga, but i could never get into any of them.. But than i randomly found this manga and it hit my interests. Boy, i couldn't believe how much i enjoyed reading! I never read books or mangas, i usually watch Anime or movies, but i don't regret starting this manga! I've been a fan of Dinosaurs ever since i was a little kid. So, it was really suprising to find a manga a about dimension where dinosaurs and humans lived happily and peacefully. Now, we have the flintstones ofc! which is an all time classical cartoon and i think almost everyone grew up with it! But this manga was something different. Instead of living in the prehistory, this dimension is actually playing in the modern time! And Dinosaurs evolved into half humans!? It sounds so bad at first, but wait till you start reading it! it's so cute and hilarious! I have to get used to the black-white style, since i only watched animes. Coloring is an really important faction for me when it comes to art. But the characters were all so well drawn, that i didn't miss the colors. the characters are loveble if you ask me! Specially gotta love Churio and her dense personallity. As we might all know, Tyranosaurus rex has extremely small brains, making them well, not all too smart. I think the author of this manga really adepted this theory well on churio's character! Yuuma and churio are so cute together! Im not going to spoil any other characters as it might spoil the story. I don't think ive laughed this much while reading, i really enjoyed reading it! I was reading page after page and before i knew it, it was finished!. Of course this is never going to have an animation,But i would so watch it if there would! Overall, i have no regrets of this being my first ever finished manga and i hope i'll start reading more manga after this!